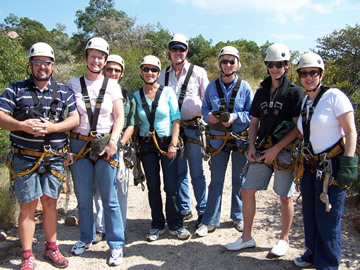 If you’re looking for a team building activity that is adventurous or challenging th en, Zip Lining Adventure is for you.Your team will be safely suspended high in the trees as they climb a tree top course with varying degrees of thrilling elements, such as zip lines, Tarzan swings, nets, bridges and many more activities to take you along the tree line of the forest. We’ll harness them up, give them safety instructions and send them off on their own! Have no fear, our experienced guides are stationed throughout the course, providing direction, tips and even words of encouragement when they need them.